Structural insulated panels (SIPs) are engineered panels used to construct walls, ceilings, and floors. As a replacement for construction methods using traditional framing lumber and insulation, SIPs provide an extremely durable, strong, and energy-efficient building option. Structural insulated panels typically consist of a rigid foam insulation layer sandwiched between two structural skin surfaces, such as oriented strand board (OSB). These panels are manufactured in various sizes or dimensions, with thicknesses ranging from 4 to 8 inches. SIPs can also be manufactured in larger sizes for custom work, but these larger panels may require a crane for installation. SIPs for interior sheathing can also be custom-tailored to particular needs as the project specifications require. SIPs can handle dead loads of about 10 pounds per square foot (PSF) and live loads up to 70 PSF. They can be used in roofs and floors as well as walls and can span as much as 18 feet with no additional support. This makes them considerably stronger than comparable surfaces constructed with traditional wood framing. The concept behind structural insulated panels was born in the 1930s when the U.S. Forest Service began experimenting with ways to conserve natural resources. SIPs became popular in the commercial construction market in the 1970s, when manufacturers started marketing these products as an alternative to standard framing methods using dimension lumber. The residential building market in the Northeast was the first area to see regular use of SIPs. Although still far less common than wood framing, SIPS have many advantages that should be weighed when designing a commercial or residential building. The method of manufacturing is a very important consideration when weighing the selection of SIPs since quality control during fabrication will determine the performance and longevity of the panels. Especially critical is understanding how the surface panels are bonded or glued to the insulation material. Improperly glued or cured panels will suffer in performance and may even delaminate. Some manufacturers are examining ways of using cementitious and rigid fibrous insulating materials to ensure good bonding. 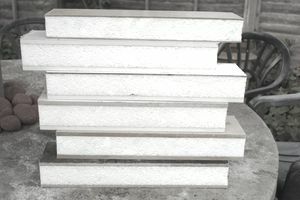 Expanded polystyrene insulated panels: The vast majority of SIPs are being manufactured using expanded polystyrene (EPS) foam board insulation, a closed-cell type of insulation. This type of insulation, when used in structural insulated panels, offers an R-value (measurement of insulation) of R-4 to R-5 per inch of thickness. Total R-value for these panels can be as high as 13.8. EPS panels are available in sizes ranging between 4 and 24 feet in width. Polyurethane or polyisocyanurate insulated panels: Polyurethane and polyisocyanurate SIPs have a nominal R-value of around R-6 to R-7 per inch of thickness. These panels are usually manufactured as 3.5-inch-thick panels for walls, and panels up to 7.5 inches thick for ceilings. This type of SIP panel is more expensive than EPS panels, but it is more resistant to water and fire and has a higher R-value. When liquid forms of polyisocyanurate or polyurethane are used, this sometimes reduces the initial R-value of the SIP, but it can also make the panel stronger. Liquid foam contains a blowing agent that can escape over time, reducing the R-value, but as the foam hardens, it forms a very strong bond to the outer skins, creating a stronger panel. These types of panels, when used with metal surface skins, are sometimes used instead of prefabricated tilt-up walls for construction, thanks to their strength and ease of installation. Compressed straw-core insulated panels: Compressed straw-core insulated panels are "greener" than other types of SIPs because they are manufactured using renewable and recycled waste agricultural straw. These types of panels, although more environmentally friendly, do not produce the high R-values of other types of SIPs. SIPs offer benefits at all levels of building design and construction—for architects, designers, builders, and the residents or occupiers of the building. Panels have many uses, including internal and external walls, floors, and roof surfaces. Roof trusses can be eliminated, which allows living space beneath the roof. SIPs are structurally superior to traditional wood framing—stronger and less susceptible to shifting. SIP-constructed buildings are roughly 50 percent more energy efficient than those constructed with traditional framing. Equivalent U-values can be achieved with thinner walls. SIP panels can be combined with other building materials, such as brick, block, stone, tiles, slate, wood, steel, and glass. Input can be offered in the earliest stages of panel selection and building design. SIPs offer more creative freedom without the constraints of conventional building materials. It is easier to create full CAD assembly drawings when designing with SIPs. SIPs can be used in many different commercial and residential applications and are compatible with other forms of construction. Buildings built with traditional framing can easily be supplemented or remodeled using SIPs. Use of SIPs can shorten construction time by two to three times. Less supervision is required on the building site. No specialized tools are required. Estimating costs is a simple, more accurate process. Buildings constructed with SIPs are airtight and free of drafts and cold areas. SIP roof systems eliminate the need for trusses, allowing space under the roof to serve as usable living space. SIPs allow a home or office to be constructed much faster than is possible with traditional framing. Labor costs are reduced when compared to traditional framing. Energy bills can be reduced as much 50 to 60 percent in a building constructed with structural insulated panels. Buildings constructed with SIPs are considerably quieter than with traditional framing. SIPs can be an important element in soundproofing design.